The Settlers Inn at Bingham Park is an Arts & Crafts inn located in Hawley, Pennsylvania. William Penn owned the land and then deeded it to his son. It was then given to James Wilson, one of the signers of the Declaration of Independence. Hawley is a borough in Wayne County, two hours from New York City, and named for Irad Hawley, first president of the Pennsylvania Coal Company. The inn was built in 1927, at the same time Lake Wallenpaupack was created by the Pennsylvania Power & Light Company for hydroelectric power. The name "Wallenpaupack" comes from the Leni-Lenape Indians and means "The Stream of Swift and Slow Water." Although designed by a Long Island architect and built by the community between 1927 and 1929, the inn never opened due to the Depression and sat empty until 1944 when it opened with 54 rooms. The current owners purchased the inn in the 1980’s, transforming and updating it in keeping with the Arts & Crafts features of the local community and consolidating rooms to create 21 individually designed rooms. 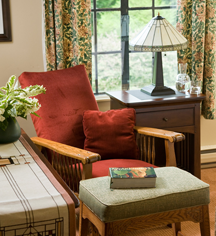 This beautiful and serene inn is a top 25 AAA 4-Diamond Historic Hotel, decorated with carefully chosen Arts & Crafts style furnishings such as hand-screened Bradbury and Bradbury wallpapers and hand-made Fulper tiles. The 21 rooms are true to the Arts and Crafts style and enhanced with featherbeds, luxury linens, and modern amenities. Environmentally responsible as well, the inn has been recognized for its water and energy conservation. The owners have prepared farm-to-table meals for decades as early pioneers of the concept. Owner-chef Grant Gezlinger prepares homemade artisan breads and delicious entrees in The Chestnut Tavern. It features a roaring fireplace, wine tastings regularly as well as summertime weekly jazz performances. For arts & crafts enthusiasts the Dorflinger Museum has a wonderful exhibit of Dorflinger Glass which was produced in White Mills, Pennsylvania, from 1852 to 1921. The factory, founded by Christian Dorflinger, was renowned for its cut glass and stemware. Another great destination is Steamtown National Historic Site, in Scranton, Penn., is a perfect historic outing and is operated by the National Parks Service. There are three ski slopes nearby or enjoy fly fishing in the Lackawaxen River, which flows behind the inn, or biking on the local trails. The 13½ mile long Lake Wallenpaupack, with its 52 miles of shoreline, as well as the rest of the Lakes Region of the Poconos offers options for your leisure activities in all seasons. 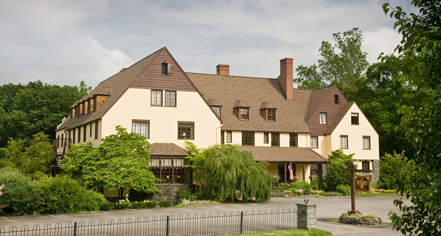 The Settlers Inn at Bingham Park, a member of Historic Hotels Worldwide since 2013, dates back to 1927. William Penn first owned the Settlers Inn land, which he later deeded to his son. It was then passed to James Wilson, one of the signers of the Declaration of Independence. Adjoining Rooms: One set of adjoining rooms is available. Please contact hotel to request. Cancellation Policy: September 1-June 30 (excluding holidays): Cancellations must be made 72 hours in advance to avoid incurring fee. July and August: Cancellations must be made 3 weeks prior to arrival. Cribs and Pack-in-Plays: Available upon request; $20. Deposit: Credit card guarantee; one night’s stay plus tax. Extra Person Fees: $20 per person per night. Hotel/Resort Fees & Taxes: All reservations may be subject to a 9% state and local tax. Occupancy Restrictions: Two people; some rooms can accommodate a third for a fee. Parking: Self-parking: Available; complimentary. Tesla Charging Station. Pet Policy: Service animals allowed: Yes Pets allowed: Yes. Services: Max’s Wagaway. Restrictions: Maximum weight: 50 lbs (recommended). Fees: $272-306 per night plus tax and service (additional charge for additional pets). Other: Must be preapproved. Longer than two night stays must be booked through hotel. Dog Ambassador: Max. Rollaways: Available for some rooms; $20 per night. The Settlers Inn at Bingham Park is an Arts & Crafts inn located in Hawley, Pennsylvania. William Penn owned the land and then deeded it to his son. It was then given to James Wilson, one of the signers of the Declaration of Independence. Learn more about the History of The Settlers Inn at Bingham Park .